This article focuses on the benefits of using cloud-based software. This article will discuss what’s at stake in terms of how you leverage diverse company data types to enable optimized decision-making in 2018. This article will focus on the Cloud-Based Enterprise Reporting for Banks. Planning Your Thanksgiving Dinner with Business Intelligence! The week is finally here where we gather around the table and share a delicious Thanksgiving meal with our loved ones. As much as we enjoy the good food, family time, and days off from work, organizing and hosting this special dinner can be a daunting task. Similar to the process of creating effective reports and dashboards that help your business, planning a Thanksgiving dinner requires thorough research and specific BI features that make the process easy and enjoyable for everyone. This blog will explore the parallels between the process used to plan a Thanksgiving meal in the modern age and the latest in BI tools for Corporate Performance Management (CPM), (i.e. 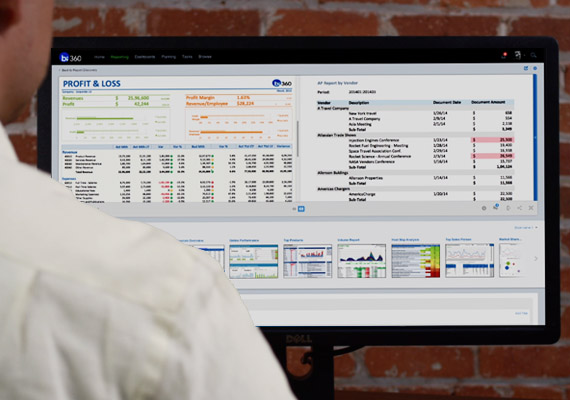 financial reporting, budgeting, dashboards, and data management). Let’s start at the beginning. A few weeks ago, like many of you, I decided to start planning out my Thanksgiving dinner. Knowing that my younger brother has a sweet tooth, but my dad prefers savory entrees and side dishes, I sent out a Google spreadsheet to find out what everyone wanted to eat. Given that we live in different cities, I asked each family member to fill in his or her favorite dishes into the spreadsheet. The results were a little messy to say the least. In this article, we discuss how business Intelligence (BI) tools have helped not-for-profit organizations focus more on their mission and less on budgeting and reporting. Thanksgiving is right around the corner, and we thought it would be appropriate to dedicate this article to not-for-profit organizations – organizations with the purpose of something other than making a profit and often focused on furthering a particular social cause – and focus on how business intelligence (BI) tools have made the jobs in their industry easier. In this article, we are going to zoom in on the tools that not-for-profit organizations have expressed they are thankful for, and hopefully, this will give you an idea of what modern BI tools can do for your not-for-profit organization. The other day, I met with Solver’s Chief Technology Officer (CTO) Mike Applegate to talk about the next generation cloud-based tools. I made my way to his office, which is located right next to the kitchen – how convenient, right? His office has multiple brainstorming sessions of project ideas and notes on the white wall to your right when you walk in and simple black photo frames of his two beautiful children propped behind his desk. This article focuses on finding an improved solution for a bad software implementation. We all wish for a successful software implementation, but information system projects frequently fall short or even fail. Many software implementations can be challenging, and only a few companies today achieve highly successful software implementations on their first try. Usually, the reason for failure or a bad budget implementation has little to do with the actual software itself. In this article, we will explore the seventh installment of our budget series: how to fix a bad budget software implementation. This article focuses on best practices to improve your budget process. Think about all of the time and energy your company allocates to budgeting. Managers often scramble to collect financial data from multiple sources in consistent formats. Rather than aiding the process as they should, differing technology tools only add to the manual process. I feel incredibly overwhelmed just thinking about it, but these 12 best practices have helped immensely. This article will explore 12 best practices anyone can implement to improve the quality of his/her budget to stay on track now and into the future. This article will focus on the process of preparing for a successful software implementation. Congratulations! You’ve finally made the first step in investing in a budgeting software. This is huge. Budgeting solutions will make a world of difference in streamlining painful, manual processes and will also often improve decision-making capabilities. Whether you are about to buy a tool or you just purchased one, you are on the verge of a software implementation. Many software implementations can be challenging, and only a few companies today achieve successful software implementations on the first try. In this article, we will explore the sixth installment of our budgeting series: how to prepare for your first budget software implementation. This article will discuss the topic of easy user security in budgeting software. We live in a society where security should never be overlooked. We hear and witness hacking stories and security issues all the time. Legendary Limp Bizkit frontman Fred Durst not so famously once said “if you want to know how not secure you are, just take a look around. Nothing’s secure. Nothing’s safe. I don’t hate technology, I don’t hate hackers, because that’s just what comes with it, without those hackers we wouldn’t solve the problems we need to solve, especially security.” In the same way, companies too have to assume that their data is not in a safe place. Over all, as technology moves to the cloud and/or web-based budgeting solutions, data is making the move, too. This article will approach the topic of security, the fifth installment of our series on budgeting.